Cambridge City Council’s standard conditions on “Advertising and Livery on Licensed Hackney Carriage and Private Hire Vehicles” were amended at a licensing committee meeting on the 25th of January 2010. 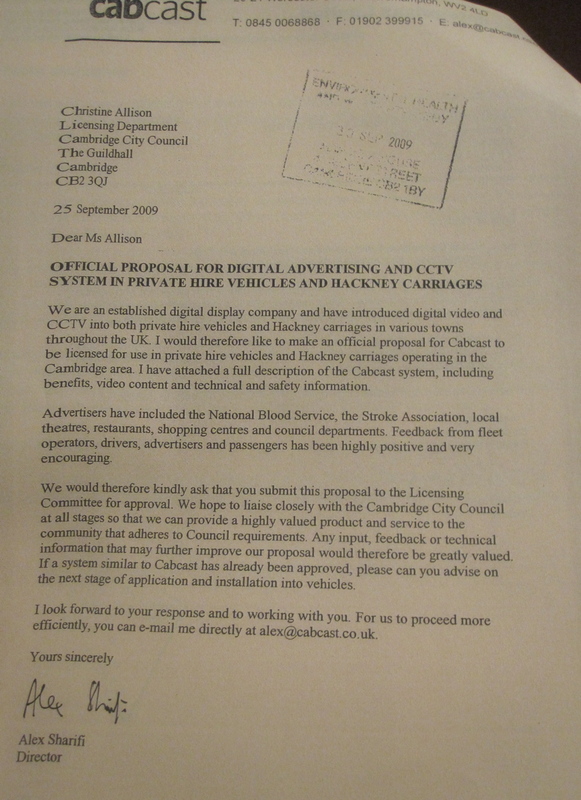 The item had been placed on the councillors’ agenda following a letter from Alex Sharifi who is promoting a system called Cabcast; a combined advertising screen and CCTV system for use in taxis (the council had also been approached by Taxiad.co.uk). The position prior to the meeting was that the city council’s conditions banned all advertising inside taxis (only permitting official notices). Electronic advertising screens are now allowed in Cambridge taxis. Advertising on the outside of Private Hire cars has been banned, but is allowed on other taxis. CCTV in taxis is currently not regulated by the council, there are no restrictions on who can see it, how long its kept etc. City Council licensing officers doubt any city taxis have CCTV, even if they have signs saying they do. A number of Liberal Democrats don’t want CCTV in taxis (apparently regardless of how its regulated). The report on the item which officers had prepared prior to the meeting failed to explain to councillors what the city council’s current position was on regulating CCTV in taxis. Cllr Colin Rosenstiel, who has served as an elected representative in the city since 1973, professed to be able to assist the committee on this point. He stated categorically that the City Council had, though a now defunct organisation, “The City Board”, adopted policy of promoting CCTV in taxis. Reacting to this news Cllr Stuart said that she “would prefer not to get in a taxi with CCTV”; as other Liberal Democrats began muttering agreement with Cllr Stuart, Cllr Rosenstiel interjected to forcefully tell his party colleagues that they couldn’t reverse the council’s policy to promote CCTV in taxis without taking it to the full council. He said: “It is the policy of this council – to promote CCTV in taxis; it has gone wrong [there hasn't been much take-up] but this is an opportunity to put it right”. Colin Rosenstiel went further, he reassured Cllr Stuart and the other members of the committee saying that there are “conditions” imposed on the use of CCTV in taxis, he described safeguards he implied were in-place which are designed to ensure only the police and council have access to CCTV images from taxis. The Cabcast proposal which had been provided in the meeting papers indicated the system had capability to encrypt data allowing compliance with such safeguards; Cllr Rosensteil may have been basing his comments on that rather than any condition imposed by the council. There are no regulations (or similar) governing the use of CCTV in taxis licensed by Cambridge City Council. Cllr Julie Smith was the only councillor at the meeting who expressed concern about taking Cllr Rosenstiel’s word for the city’s current policy; she said that on the grounds of the lack of information in the report she would vote against any change to the standard advertising conditions which in any way linked advertising to CCTV. Other councillors mused about how CCTV in taxis ought be regulated. Cllr McGovern said that in New York taxis have CCTV which is automatically deleted after 24 hours on a rolling basis (Cabcast’s specifications included a 30 day storage capability), and another Liberal Democrat raised the possibility of taxi customers being given the ability to turn the CCTV off; in response to the latter point Labour’s Councillor Blencowe patiently explained this would defeat the point of the CCTV which would be installed to protect both drivers and passengers . City Council licensing officer Debs Jones told the committee that while a number of taxis in the city currently displayed notices saying they were covered by CCTV these were all dummy notices and she doubted any vehicles actually had CCTV. Cllr Smith said she does not support the increase of CCTV in these circumstances, she said she is “absolutely opposed to proposals which would increase CCTV”; an interesting stance for a Liberal Democrat Executive Councillor in leading a council which spends so much of its discretionary funds on an extensive city centre CCTV network. Cllr Smith asked officers what powers the council had to limit the use of CCTV in taxis but she got no response. Cllr Blencowe said that CCTV wasn’t central to the matter under discussion, which was the change in the advertising rules, though he did say “driver safety is of paramount concern these days; lots of cases go to the criminal courts and if CCTV can be fitted as a result of allowing this [the changes to the advertising rules] then that is to be welcomed”. He also said he thought a “Safer City Bid” [for a grant] had been made to enable taxi drivers to fit CCTV and wondered what had happened to that. Cllr Rosenstiel said: “it is important CCTV is regulated by code of conduct applied to CCTV the council operates itsself”, he suggested this ought be a licence condition and suggested the committee ought update the conditions. While he didn’t mention it, this would have the effect of banning signs saying there was CCTV if there wasn’t really any. He said he supported regulated CCTV as a way of “improving the safety and security of the cab trade”. Officers told councillors that advertising screens were “contrary to current licensing conditions”. Cllr Rosenstiel said: “In these deregulated days it is difficult to resist this proposal”; he proposed insisting the passengers always have the option to turn the screen off. (The option to do this was included in the Cabcast proposal, but councillors were legislating for all potential systems not just that one). Clle Blencowe noted that he had ridden in a Cambridge taxi with such a screen recently. He said he personally hadn’t minded it and it had proved a welcome distraction on the journey. He said they would be a benefit to the public interest in the city and he could see why Love Cambridge and others were keen to have them promoted. He said the update to the conditions was required, as it was essential to move with the times. He said that his ride in taxi which, rightly or wrongly, had the technology before Christmas had told him they were “no big deal”. He said he supported updating the conditions as they were merely “updating to where we are today”. Rather oddly he added “we are there to be guardians of the public interest whether they like it or not” – perhaps alluding to his comments about Love Cambridge and how the message appeared to have got through to councillors that this body was supporting the proposals in the economic interests of the city; I believe Cllr Blencowe was saying that a those city residents who might not like the screens needed to accept them in the wider interests of the city. Green Party Councillor Margaret Wright was the most vocal opponent of the screens, she said knew Love Cambridge would want this but said “one can end up in a taxi needing to have work conversations; or in a tired and emotional state and need to ask for the screen to be turned off.” She said people would be “trapped as in a post office with an advertising screen” and described the proposals as a “real intrusion” saying “from the public point of view there are people who would find this distracting and unwelcome”. Cllr Hart looked astonished as Cllr Wright talked of “tired and emotional” people using taxis; other councillors confirmed they too were minded to require screens which can be turned off by passengers. Cllr McGovern formally proposed an amendment to the officers recommendations which would have had the effect of banning advertising screens. This was put to the vote, the committee split equally, and it was down to a chair’s vote – Cllr Stuart cast her vote against the amendment and in favour of allowing advertising screens. Cllr Upstone proposed permitting advertising internally only where CCTV is installed; this was also put to the vote but only Cllrs Rosenstiel and Upstone voted in favour of it and the others against. Cllr Rosenstiel said the key issue with respect to external advertising was ensuring the city crest, which is used to distinguish between private hire and Hackney Carriage vehicles, is clearly visible. He expressed a concern that on a liveried cab the crest might be less clear than it is when it is on a solid colour background. He proposed insisting on a white background for the crest on all cars. Cllr Shah declared an interest saying “in my profession I do have taxi-drivers as clients”. (Cllr Shah’s only declared employer is Melbourn Village College) so this is puzzling. Cllr Shah said : “Once we allow advertising every space will be taken up; I suggest some kind of distance set from official notices I don’t want clutter”; his fellow councillors pointed him to the various proposed conditions intended to address his concerns. Cllr McGovern noted the lack of : “No Pre-book, No Insurance , No Ride” signage in Cambridge and suggested it could be required; he said he didn’t notice these kind of signs on private hire cars in the city but had seen them elsewhere. Officers said it was required, but the lettering only had to be one inch high so most had it only that high, whereas elsewhere the notices were bigger. Officers told councillors that they had received no representations from any taxi drivers or taxi companies despite officers seeking comments; particularly on the proposal to ban external advertising from private hire cars. Cllr Liddle, who commutes in from Woodditton to represent the residents of Chesterton, was the first to comment on the City Council’s proposed rules limiting what could be advertised on and in taxis. She said the rule banning material “disadvantageous to the council” had to “go right out”, noting the city council shouldn’t be in the business of censoring its critics. She went further and proposed removing all the councils rules on what adverts can go on taxis – saying she didn’t want council officers having to determine what would banned on the grounds of being “sexual”, “political”, “ethnic” or “controversial” – all categories councillors were being invited to out-law. Other councillors agreed with Cllr Liddle on this point; councillors got rid of their own rules on advertising content and directed officers (who will still get the opportunity to refuse to re-license a non-compliant cab) to follow the lead set by the Advertising Standards Agency. Kings Hedges Councillor, Liberal Democrat Neale Upstone said he had two major concerns with respect to taxi advertising. The first being “the issue of external advertising where there is an environmental aspect resulting in visual intrusion in the historic city”. The second, and more thought provoking was the “financial implications on the taxi trade and the knock on effect of that”. 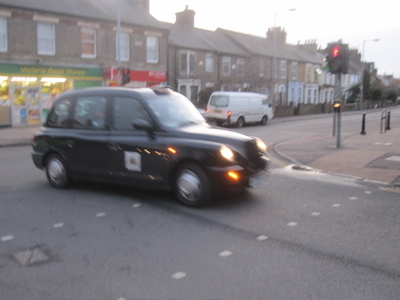 Cllr Upstone’s latter point was another comment on the officers’ report which claimed there were no financial implications relating to the review of the taxi advertising rules. Cllr Upstone suggested that if the increased advertising was approved then the committee should “make an indication that we’d expect to reduce fares as a result”. (Hackney Carriage fares in the city are regulated by the City Council’s licensing committee). Cllr McGovern responded to Cllr Upstone by pointing out it was not taxi drivers but the equipment company who had approached the council. He pointed out that in the case of Cabcast drivers (or cab companies) get a CCTV system in return, not extra income. Cllr Hart expressed concern at Cllr Upstone’s suggestion. She said that some of the big companies might be able to afford to have expensive ad-screen systems fitted and could benefit from the extra income whereas smaller operators and individuals might not be in a position to invest. Cllr Hart argued the Hackney Carriage rates should not be linked to advertising potential because all drivers would not be able to raise income from advertising equally; she warned Cllr Upstone’s proposal could result in a danger of driving out smaller companies and independents. Some councillors, forgetting they were regulating for all systems and not just the Cabcast one argued against Cllr Hart’s suggestion that an investment from cab owners was required. Cllr Upstone said the comment was valid and it was worth considering the potential impact on small operators. Emma and I have been through the proposed changes to the advertising conditions and broadly are in support of allowing advertising within licensed vehicles along the lines suggested in your letter. We believe customers travelling in taxis are a great captive audience and allowing advertising within vehicles would provide Love Cambridge and Visit Cambridge with a great medium to ensure all visitors to Cambridge (including residents) are aware of the broader offer Cambridge has. “Emma” is presumably “Emma Thornton” who was Cambridge City Council’s head of tourism and city centre management, and now is still the City Council head of tourism but now also described as “Head of Love Cambridge” on Love Cambridge press releases, Helen is, Helen Hames Love Cambridge’s “Partnership Manager”. The argument for creating “Love Cambridge” was in part to create a group which would channel the views of those with an interest in changes to the city centre back to decision making councillors. This isn’t happening if consultations are being responded to on the back of two administrators in an office looking through a proposal rather than following a process where the views of those representing the groups who make-up Love Cambridge are being sought. The council doesn’t have its own set of rules on the content of taxi advertising. Council officers will make judgements based on Advertising Standards Agency guidelines, rulings etc. Media screens mounted in the front seat headrests or “on the glazed partition immediately behind the driver’s head” are now permitted. No associated sound is allowed and passengers must be able to turn the screen off. Advertisements must not obscure or distract attention from the Cambridge City Hackney Carriage Crest and must be placed at least the distance specified in the regulations from the Crest. A vote on the final proposals was taken with the committee splitting five in favour and three against. As I understand it the incorporation of the London rules does not extend to requiring prior permission from the council for internal adverts ie. the content of what will go on display screens (It’s only the definition of “full liveried vehicle” which is derived from London). I was surprised councillors were not clearer on what, if anything, does and does not need prior approval. Compliance with the advertising rules is checked as part of the twice yearly check the council does on each taxi. Councillors also failed to determine the fate of the one private hire cab in Cambridge which already has “all over advertising on its bodywork”; despite officers prompting them to do so. I am surprised and appalled the council isn’t currently regulating CCTV use in taxis. I think that CCTV in taxis ought be permitted by the council; but it needs to be well regulated and well signed. The council ought use its role in taxi licensing to ensure safeguards are in place relating to who can access the images, how they can be used, and to require automatic rolling deletion of images occurs. Personally I think the question of if any CCTV cameras in taxis have microphones is a key issue (I’d go for no on the grounds of invasion of privacy). The prominence of signage alerting people they are being monitored is another important consideration (perhaps cameras could be required to be accompanied by a LED light to show they are operational?). The council approving systems; confirming encryption methods and image quality is sufficient would also be desirable in my view. I wouldn’t want to see all taxis compelled to use CCTV; (or conversely all taxis banned from having it); I think it ought be up to those running taxis as to what to offer. I think it is right that these decisions relating to taxi licensing are made by elected representatives at a local level. I was surprised there was relatively little discussion of the ban on advertising on private hire cabs, particularly with respect to the opportunity for taxi drivers and taxi companies to raise more money. Introducing a ban on advertising on the outside of private hire taxis at the same time as decreasing the amount of regulation on advertising on the outside of Hackney Carriages appears utterly inconsistent and inexplicable to me. Then inconsistency and fence-sitting like this is exactly what people know they’re getting when they vote Lib Dem. Banning exterior advertising on private hire cars also appears to be a step in the opposite direction to permitting both types of licensed vehicles to carry interior advertising, including on screens, for the first time. While councillors were only discussing the Advertising and Livery conditions; I would have liked to have seen the full standard conditions (and details of notable variations) associated with a taxi licenses in the city to have been made available to councillors and the public prior to the meeting. The letter sent to the council was sent on “Cabcast” headed paper, and signed, “Alex Sharifi” “Director”. However a check at companies house reveals there is no company containing “Cabcast” in its name; other associated “companies” such as UCS appear to be unregistered companies – the implications of which I’d suggest anyone considering entering contracts with Cabcast look into. The letter, and proposal, from Cabcast was supplied to councillors, the press (Raymond Brown of the Cambridge News) and public (me) at the meeting but has not been included in the official papers published online. (I have made it available via this link) Regular readers will know I have been consistently campaigning, with some success, for all such “tabled” documents to be published by the council. I believe Cllr Shah is a self-employed accountant, which would explain why he has taxi-drivers as clients, but is not employed by anyone. Not that surprising really. Cabcast sounds very dodgy, you can only be a director of a limited company, which Cabcast clearly isn’t. On the issue of small vs large companies, my point vs Cllr Hart’s was that it is a valid concern, but that the Cabcast system would help the small operators, as Cabcast were financing the CCTV, instead of operators having to cover the £400ish cost of installation themselves. My personal views on advertising are probably stronger than I came across at the meeting: I really think that advertising is out of control, and perhaps the worst part of our economic system. Advertising is so often to create a perceived need where none exists. It’s part of the “growth economy” measuring progress as GDP growth. I personally think it should be taxed in exchange for reduced VAT. In principle CCTV in taxis would seem less abusive of one’s right to privacy than in other places, but one should definitely be able to switch off the screens, in case inappropriate content comes on. As far as I’m aware the heads of non-limited companies are free to call themselves “director”, although it’s meaningless in law. I put the council licencing officer’s statement : “There are no regulations (or similar) governing the use of CCTV in taxis licensed by Cambridge City Council. ” to Cllr Rosenstiel by email and asked him “Does that surprise you? Do you agree?”. If Cllr Shah is a self-employed accountant then he ought to have declared that on his register of members interests. “Business carried out by you” has to be declared. Is there going to be any area of public space yet where advertising doesn’t have to be endured? Am I just old-fashioned in this regard? I support the comments about intrusive advertising or any compulsory communication really. I don’t know if anyone here has been in hospital recently, but it is there too, or at least was last time I was in, and it drove me round the bend. When an in-patient at the Rosie, there was a large screen by my bed (broadcasting until about 9 p.m.) which I as a patient could not switch off even when I wished to sleep … as you do when in hospital. You could pay to have different channels; if you didn’t pay you got a mixture of different screens, including government messages about the NHS! This was six years ago. If anyone knows anyone going to hospital soon I’d be interested to know if this is still in place. If Mr Sharifi was contacting the council in his capacity as a director of Lilliput UK Ltd then details of that company ought to have been on the letter. I wrote to Mr Sharifi, using the email address given in his letter, at the time I wrote the article. I have invited him to comment or respond but he hasn’t yet. The contact details on Cabcast’s website and Lilliput UK Ltd appear to have the same address. Perhaps Cabcast is just a product name? If Cabcast is a product name and the letter is signed by Mr Sharifi as a director of Lilliput UK Ltd then I believe the letter is misleading and illegal. The reason I’m raising this is I wouldn’t want to see people signing contracts with a product name; and I want to point out that the fact Cambridge City Council have reviewed their policy following a request from Mr Sharifi (in whatever capacity he was acting) isn’t a sign of endorsement; even though the letter says: “I look forward to your response and look forward to working with you”. Cambridge City Council have a track record of not conducting basic checks on companies. `In the middle of December, the Love Cambridge office received an invitation to comment on the proposed changes to advertising conditions in taxis. Unfortunately the short timescale, compounded by the Christmas break, did not allow us the opportunity to circulate the proposal to our members.The comments which were submitted were therefore as officers of the Partnership only and it was not intended that these should be represented as a formal response from Love Cambridge as a body. The officers agree that this should have been made more explicit in their response. In general the approach of Love Cambridge is as follows; given the broad range of stakeholder representation and the complexity of issues it is rare that the partnership will be able to speak with one voice. Where we are made aware of consultations and consider that they might be of interest to our membership, we will forward details onto them but we ask them to respond individually. Love Cambridge aims to “add value” by raising awareness of formal public consultations where it is made aware of them and has done so on a number of occasions over the past 10 months, including Consultation on Cambridgeshire’s Local Transport Plan; Cambridge city council’s open green space strategy, sports strategy and cyle route improvements”. I also suggest you come to the Love Cambridge members meeting on 23 February 6-8pm, where we can meet in person and we can discuss further your concerns about resident involvement with Love Cambridge. You will also hear about all the various initiatives that in place to engage with residents. I fear she may not have grasped that Love Cambridge meetings are not open to members of the public. I will write again to clarify and see if she’ll tell me where the meeting is.